In 2014 Peaceworks was busy working in the Philippines and Australia on a program co-managed by the Research Centre for Teacher Quality and the Science, Information and Communication Technology and Mathematics Education for Rural and Regional Australia (SIMERR). This informs the Philippines Department of Education on quality teaching and covers all 17 regions. Rebecca has also continued her employment with the Department of Foreign Affair and Trade as an author and facilitator of an ADF operations training manual. In September, Paddy attended the 3rd annual International Association for Peace and Conflict Studies conference in Manchester (UK) in the company of such critical peacebuilding specialists as Thania Paffenholz, Oliver Richmond and Roger Mac Ginty, and presented a paper on local, districts’ perspective of development in Timor-Leste. 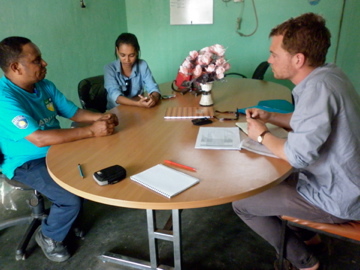 In late 2013, Rebecca and Paddy were contracted by Search for Common Ground Timor-Leste to undertake a final evaluation for the project, Women’s Empowerment and Access to Justice. This evaluation entailed traveling to the districts of Baucau, Aileu, Liquica and Dili, collecting information from almost 200 participants. Earlier in the year, Peaceworks was employed by the Centre for Democratic Institutions (CDI) to conduct an evaluation on the initiative, Women in Politics (WiP), which involved reviewing the impact of the initiative in the six CDI focus countries – Indonesia, East Timor, Fiji, Vanuatu, the Solomon Islands and Papua New Guinea. The review analysed the success of the women through the processes involved in moving into politics, either as a candidate for election, a party activist or official, or campaign supporter for women candidates. The evaluation produced a report and an AV training tool for future use by CDI. a five day training for AusAUD staff and program partners in Manila on peace and conflict in development contexts (November). Rebecca Spence was appointed to the AusAID Aid Advisory Service Standing Order in the Research, Governance, and Fragility and Conflict categories. 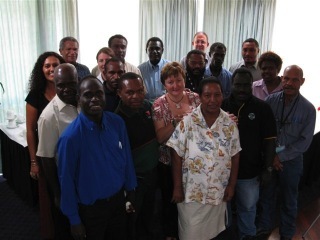 Five day training for AusAID Staff and program partner on peace and conflict in development (May – June). In 2012, Peaceworks was contracted by Family and Community Services Australia to write the accompanying educational toolkit for the UNWomen documentary, Side by Side. Toolkit consisted of key messages on UN resolutions relating to Women, Peace and Security and accompanying exercises (See Training modules). Rebecca was also employed as a facilitator of the Fijian National Women’s Forum, and designed and co-faciliated a five day training for AusAID Staff and program partners on peace and conflict in development. the design and production of a Community business plan for Regional Development Australia, Northern Inland, NSW. training and facilitating a jointing training process for AusAID and the Australian Defence Force, focusing upon safety and effectiveness of development in conflict zones. Summer Peacebuilding Institute, Eastern Mennonite University, USA June. PeaceWorks designed and instructed a five-Day course in Transforming Societal Narratives, involving 27 participants. Community Engagement Process Design and Facilitator, Regional Development Australia, Northern Inland July – December. Part of three-person team, which designed and facilitated a 27 community participatory process. The facilitation of a dialogue process between recent migrants and community groups and council in Tamworth. The Facilitation of peacebuilding trainings in Sri Lanka (March), Timor Leste (July) and Fiji (February). Facilitate a five-day deep dialogue process on transitional justice in the Pacific region, held in Nadi, Fiji. Facilitate of a Sustainable Living Forum and the consequent design of the strategic plan for the New England Strategic Alliance of Councils. Design and facilitate a five day two stage peacebuilding training for AusAID staff and program partners in the following locations: Fiji, Vanuatu, Sri Lanka, Nepal, Timor Leste, Port Moresby, Canberra, and the Solomons. Design an online resource manual for Australian Local Government Associations and Timorese District Administrations involved in the Friendship Agreements. Design and facilitate a community filmmaking education project in Fiji. Provide ongoing support to recent migrants and refugees to Armidale and the Northern Tableland area.